Officials in El Salvador say the country’s navy has seized nearly 1.7 metric tons of cocaine probably worth $42 million from a semi-submersible boat off the country’s Pacific coast. The ultimate in high-risk, high-reward smuggling is the "narco submarine," subs that can bring tonnes of product at once. 80% of drugs smuggled into the US come from maritime routes. 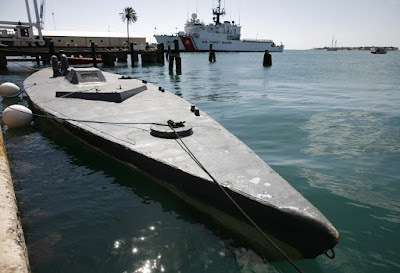 30% of the drugs that arrived in the US by sea were via narco submarines. There are four broad categories of vessels that fall under the narco label: low-profile vessels, semi-submersibles, submersibles, and towed "torpedoes." The first narco sub detected in 1993 was built from wood and fiberglass, could not submerge, and were slow. The latest models of subs travel at 10 knots, can mask their heat signature, evade sonar and radar, and use lead siding to help mask their infrared signature. Their detection and capture is extremely difficult. An 18 m (59 ft) long narco-submarine carries up to 10 tons of cocaine. They are typically made of fiberglass, powered by a 225–260 kW diesel engine and manned by a crew of four.